Our wedding was one of the best days of my life. Being able to re-live our wedding this week has been pretty emotional and thrilling all at the same time. Our wedding was the first (and only) time we were surrounded by all of our favorite people under one roof. It was such an honor to share our love for God, each other and the covenant we made, with you. By now, you're probably so sick of hearing about our wedding; but I just wanted to thank you again for all of your kind words and support this week. Here are my most memorable four moments from our wedding day. After the ceremony, guests moved onto the terrace for cocktails and hour d'oeuvres. We hired Park Ave Catering and chose a menus that incorporated some of our favorite dishes. When we were choosing our hour d'oeuvres, we wanted things that were flavorful and easy to eat (there's no point in serving an appetizer that is either too big or one you'll end up wearing). My favorites were the pancetta wrapped almond stuffed dates with a balsamic glaze. We didn't have signature cocktails but served all the wine and champagne from Trentadue Winery. 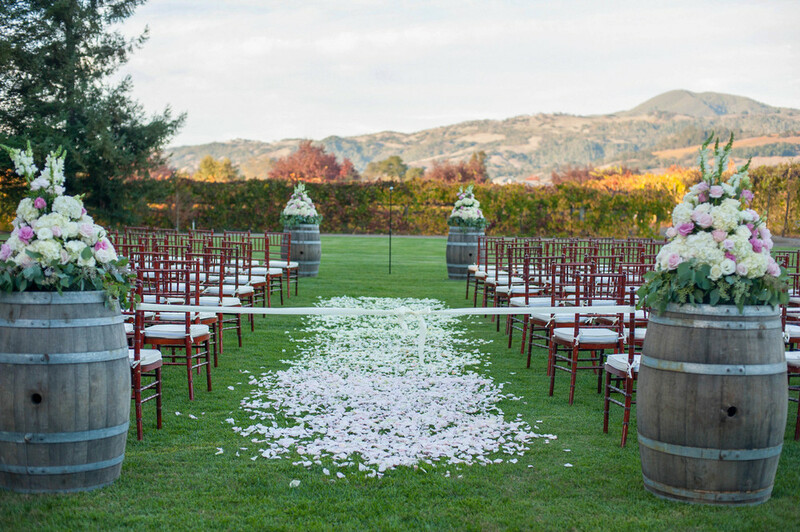 After all, how can you have a wedding at a winery without serving all the wines on their list! The wine was a hit but the 2012 La Storia Cuvée was my favorite. Then we moved into the dining room, which had a warm ambiance with yellowy-gold uplighting that filled the room. The tables were topped with flowers, candles, and plated with gold-rimmed dishes. Each table seated around eight people. We had a sit down dinner; first course was a romaine and field greens salad with glazed walnuts, daikon sprouts, topped with a sherry vinaigrette. And the entrée was a choose of either bacon wrapped bistro filet with a pinot noir sauce or pan-seared mahi, both came with local grilled veggies and skillet cooked potatoes. A few toasts were given and then the dancing started. Our first dance song was Make You Feel My Love by Adele, which we only practiced a few times (if you even call that "practicing"), so it was a bit nerve-racking to go out there and just wing our first dance. That moment was so special, there are so many eyes on us, but felt like none else was in the room. We spent months sending each other song choices, listening to lyrics and rejecting songs. 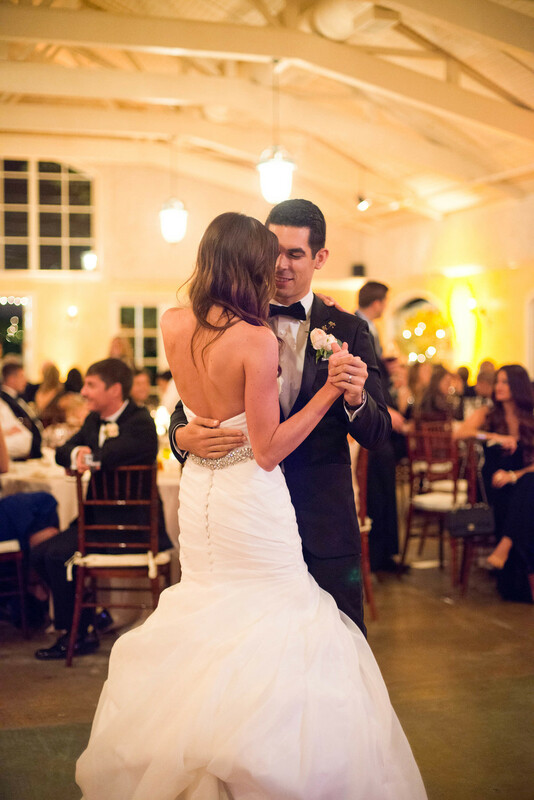 Who knew picking your first dance song is hard; you don't want to pick something cheesy, predictable or inappropriate. After our first dance, my dad came out for our father-daughter dance where we danced to Fly Me To The Moon by Frank Sinatra, and Mike and his mom danced to Wing Beneath My Wings by Bette Midler. After the three dances the floor opened things up to everyone. Our band, Smash City was so great and played such great music for the rest of the night. I don't think I left the dance floor except when we had to cut the cake. We chose carrot cake and red velvet for the cake, which everyone raved about. The port and cigar bar came our shortly after and was a huge hit to top off the night. At the end of the night, our guests gathered outside with sparklers and created a pathway that we ran through to get to our limo. A sparkler exit was so important to me, it was something I had always pictured and a huge part of picking a venue (whoops!). With California's drought, this was a hard thing to get but after some smooth talking (thanks Mike! ), we managed to make it happen. It was so amazing to see the sparkly lights as we walked through our closest friends and family cheering for us. We knew we wanted our ceremony to be several things: intimate, share our love for each other, and our covenant with God. Mike and I were so happy that a close friend and mentor, Ryon agreed to marry us. His wisdom and love truly set the tone for the entire day. From the second Mike asked me to marry him, we knew Ryon was the one. Although he had never married anyone before, we respected him and his family. We wanted the person that married us be someone we could call on for the rest of our lives, whether it be for personal, relationship, work, etc. Leading up to the wedding, we met with him and his wife, Jan, for advice on the lifelong commitment we were signing up for. We talked about who we were individually, what we bring to the table for each other, etc. It was intense but was not sugar-coated, which was something we needed to hear. We chose to not do a first look. Although it would have been easy for pictures and timing purposes, it was important for us to not see each other beforehand. Not to mention I wanted Mike's facial reaction photographed when he saw me walk down the aisle. My nerves hit right before I walked down the aisle. As we were beginning to line up: groomsmen, followed by Mike and his parents, my mom, bridesmaids, and flower girls, I took my dad's arm. He made me feel calm and collected, just like he has my entire life. Before we walked out he said "you look beautiful...I love you" and I started to loose it with tears, telling him "you can't do this right now." We walked down the ombre pink aisle to the string duo playing A Thousand Years by Christina Perri. Mike and I decided to write our own vows, which was terrifying. I was so worried I wouldn't be able to get through them without ugly crying (which totally happened), but I'm so glad we did it. We agreed on a rough word count so one wouldn't out-do the other. A few months leading up to the wedding I had an ongoing drafted email in my phone where I jotted down notes to help me write my vows. After we were pronounced husband and wife, we walked back up the aisle to Viva La Vida by Coldplay. We had a few minutes with each other before we had to fight the sunlight and take photos, then went to join the party. Did you catch yesterday's post with our wedding look? Check it out here. You've spent so much time finding the perfect dress and in-and-out of fitting appointments. Make sure someone is accountable for it being pressed and ready to go for your wedding day. If you're saying your own vows, then it's so important that you don't forget what you're going to say or what you've written down. I suggest emailing yourself a back up just incase. Since you'll be spending time getting ready with your bridesmaids, mother, future-mother-in law, and randoms coming throughout the morning, you will need something to wear thats suitable for pictures. 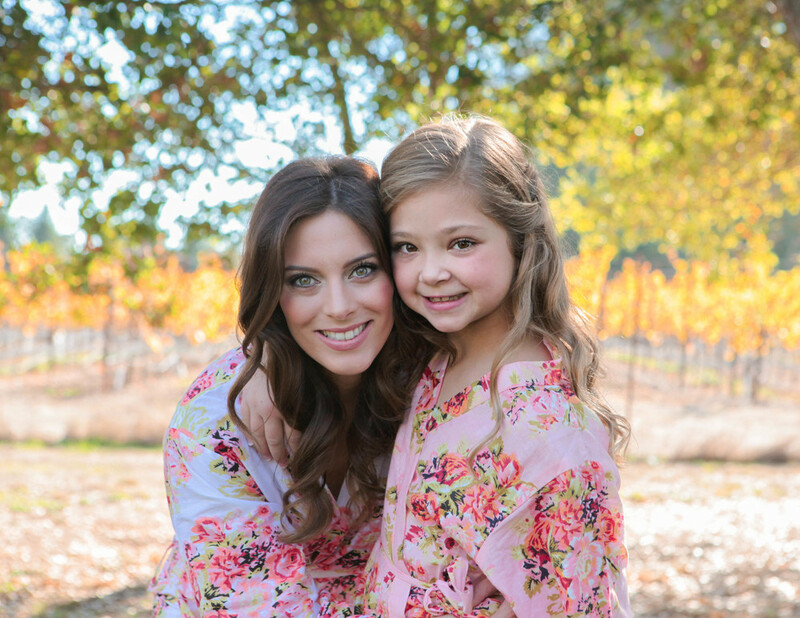 I love these robes that my bridesmaids and I wore, but another great option is this wifey tee. In case tip wasn't included with any vendors, you want to make sure to bring tip money and have a close family member or your wedding planner do the tipping. After all, there isn't anywhere for you to store it ;-) Also, something can come up and someone else wants to get their hair/makeup done so you have to pay for their extra services. Regardless, it's always better to be safe than sorry and scrambling on your wedding day. Do forget something on your wedding day? Or have any other tips for future brides not to forget? I'd love to read them in the comments below!